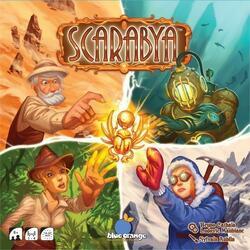 As the leader of an international team of archaeologists, your job is to establish excavation sites around the globe and to find Scarabya's golden beetles. Scarabya is a tile-laying game, in which your goal is to surround the beetles by positioning your tiles so that they create closed areas of 1 to 4 squares. Each scarab in a closed area has a number of points equal to the number of squares in its area. Players play all the same tiles, in order. The game is over after all 12 tiles have been drawn. The player with the most points wins the game.